It’s All the Entertainment You Need! Starring Jesper Christensen, Anders Baasmo Christiansen, Karl Markovics, Juliane Köhler, Rolf Kristian Larsen, Andreas Lust, Tuva Novotny and Katharina Shüttler. Screenplay by Harald Rosenløw-Eeg and Jan Trygve Røyneland. Distributed by Paradox Films. 133 minutes. Not Rated. Norwegian entry for Best Foreign Language film at the 89th Academy Awards. America was a latecomer to join World War II, after the attack on Pearl Harbor in December 1941. Two years earlier, in September 1939, Nazi Germany attacked Poland and began their campaign of aggression. In school, we spend time learning about the basic history of the war, the heavy players involved, the Axis and the Allies. But nearly every country in the world had some involvement in this war and each has a story to share. 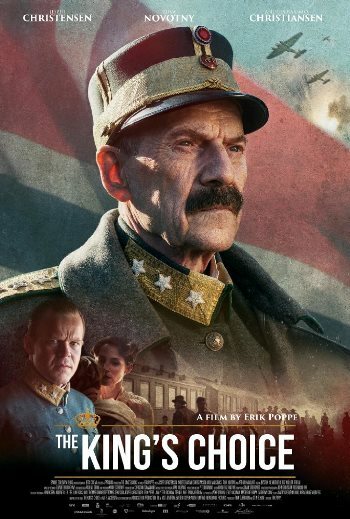 The King’s Choice describes three harrowing days in Norway’s story, detailing their beloved King Haakon’s direct refusal to give over his country to Hitler and Nazi Germany. The opening credits begin with a brief history of Norway’s independence from Sweden in 1905 and their people’s choice for a constitutional monarchy. The throne was offered to Prince Carl of Denmark and his role was to be ceremonial, leaving political power to the Parliament and Cabinet. He arrived to Norway in November 1905 as King Haakon VII. This is part of recorded history. The movie opens with a montage of historical footage of the King, Queen Maud and their son, the Crown Prince Olav. The stage has been set to understand that this beloved family was chosen by their people and as the first chosen king, he directly understood, accepted and respected his role and duty to his people. The German envoy Curt Brauer (played by Karl Markovics) who has been living with the Norwegian people, knows their spirit and is compelled to negotiate, risking his career and family. The Commander Oberst Birger Eriksen (played by Erik Hivju) responsible for his soldiers and his country, we watch him give the order to fire on the Nazi’s. The young soldier, Fredrik Seeberg (played by Arthur Hakalhati) embodies the love of the people for their King and in return, gives weight to the King’s grave decision to refuse Hitler’s terms. The story always returns to King Haakon VII, at the center of this choice. Norway’s beloved ceremonial figurehead is targeted by Hitler to be the point of negotiation, instead of the Parliament and Cabinet with the true political power. From what we know about Hitler, this is a direct nod to the respect of the nation for the King. We are shown a grandfather who playfully interacts with his grandchildren in a snowstorm, a father of the future king measuring his words while respectfully guiding his son along his future path, and a man who will forgo his safety to protect a small child during an air raid. He is a man who lives by example and is loved for it. Copyright ©2017 PopEntertainment.com. All rights reserved. Posted: October 13, 2017. Tags: adolf hitler, Anders Baasmo Christiansen, Andreas Lust, Bonnie Paul, Erik Poppe, Harald Rosenløw-Eeg, Jan Trygve Røyneland, Jesper Christensen, Juliane Köhler, Karl Markovics, Katharina Shüttler, King Haakon, King Haakon VII, movie review, Norway, PopEntertainment.com, Rolf Kristian Larsen, Sweden, The King's Choice, Tuva Novotny, world war ii. Bookmark the permalink. Brittany Snow, DeWanda Wise and Jennifer Kaytin Robinson – The Greatest Someone Might Just Be Yourself!